Barrie, Ontario is full of beautiful parks and nature trails to walk through. But that’s such a passive way to enjoy the outdoors. 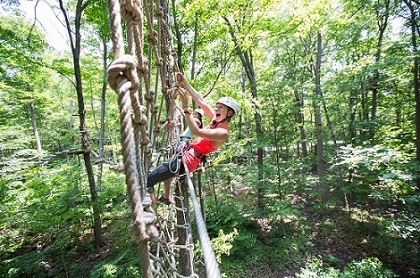 Take your outdoor adventures to the next level and consider Treetop Trekking. The course is graduated, with levels ranging from easy to advanced. Choose your own pace and progression, too. “It’s not like other activities, like downhill skiing, where you need years of lessons to get good at it.” So no matter if it’s your first time or your fiftieth, you’ll be at a level that you’re comfortable with. Despite the anxiety some might experience being so high up, he promises that everything is completely safe. “It’s definitely not dangerous. 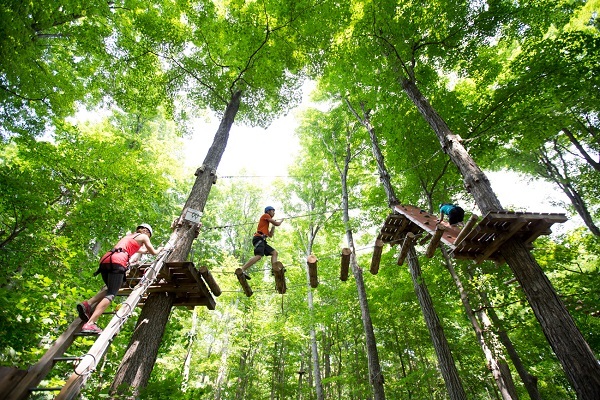 The zip line industry, particularly in Ontario, is highly regulated.” Safety is key when it comes to Treetop Trekking. It takes a ton of training to become a guide, and they check over all the equipment every day. There are five locations in Ontario, and they have a sister company in Quebec called Abraska. “The Barrie park was our first location in Ontario,” Stiell says. “It’s the first park of its kind in Ontario.” And while similar parks have popped up, Barrie’s still going strong, with new activities constantly being planned and added.